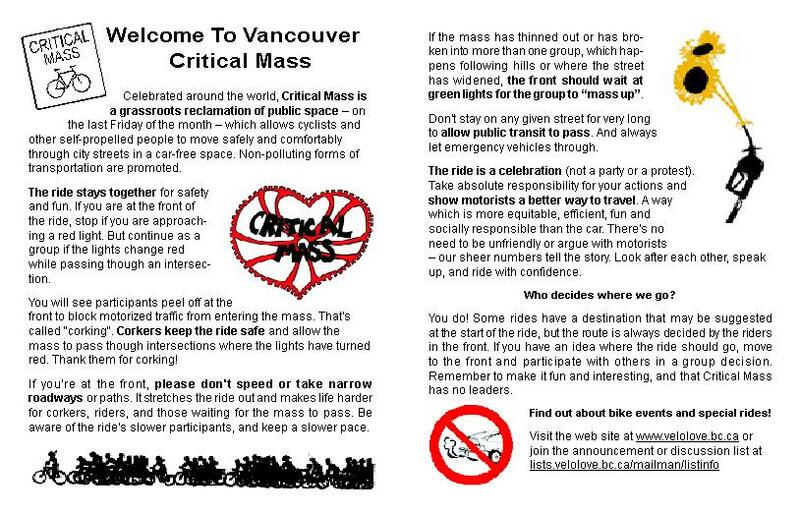 You are invited to the Critical Mass, We Are Traffic, Potluck & Discussion to assess the current situation of Critical Mass in light of all the attention the city and media has given the rides. Bring some tasty food to share and a plate / cup / utensil. Probably best to think of this as an alcohol-free space so we can get some work done too. Please talk to others, and encourage your friends to join the conversation. We are all leading this crazy thing! Discussion will begin at 6:45pm. Likely we will have some initial discussion to frame the issues, then break off into working groups so that we can talk about aspects of the ride which we are most personally passionate about. From the handlebars of a bicycle, your perception of the world will change forever. Come be inspired at the film screening of "Long Road North" -- a documentary, along with short bike polo film. For those that haven't yet seen this film, you must come out. It is an incredible inspiring story. It has sold out each time it has screened. Drawn by a longing for another horizon, Gwendal Castellan plans to cycle halfway across the planet. From the tip of Patagonia to the far reaches of the Canadian Arctic, he makes the road his home for 19 months. Yearning for connections that give meaning, this is a journey to discover the world, his family, and a sense of place. This event is a fundraiser for the East Van Crown Bike Polo Tournament taking place September 18-20. Thanks to the Gwendal Castallan, North Coast Films, and Antipodes Expeditions for sharing his journey with us and supporting the tournament. Get a tour of Vancouver's urban and architectural landmarks by bike with Vancouverism by Bicycle. You'll be accompanied by an interpreter from the Museum of Vancouver (MOV) along with experienced cycling guides from the Vancouver Area Cycling Coalition (VACC). The rides run Saturdays at 10:00 am from July 18 to August 22 and start at the MOV (1100 Chestnut Street, Vanier Park). This summer, Slow Food Vancouver is offering two Slow Food Cycle Tours in the Fraser Valley. The 3rd annual Cycle Tour Agassiz will be held on Saturday, August 22nd and the 1st annual Cycle Tour Chilliwack will be held on Sunday, August 23rd. Come to Agassiz and Chilliwack to participate in the self-guided bicycle rides. Sales guys gotta have a motor vehicle, right? Not according to Steve Mitchell. The NRG Cycling products sales rep's groundbreaking pedal-powered 2007 sales trip across British Columbia was a concrete example that not every sales call has to be made by car! Join the Bike Doctor and Steve for pictures and stories from his innovative adventure, bike touring trips from a guy with thousands of kilometres of two-wheeled travel under his belt and a Q & A on the NRG products he represents (Ortleib, Sombrio, Electra, Knolly, and more). Do you have a bike and like riding at night? Dig up some bike lights, pack yourself a nice beverage, and join the ride the night before Critical Mass! 10:30am to Noon Pacifica time, last Friday of every month. Join fellow bicyclists, skaters, and bladers for this leisurely and spirited celebratory ride and roll through the streets of Vancouver. Meet at the Vancouver Art Gallery on the Georgia Street side between 5:00 and 5:30 p.m. -- and roll and ride at 6:00 p.m. The ride is on rain or shine! Decorated bicycles, trailers, signs, flags, noisemakers, gettoblasters, sound systems, drums, and wildly modified bicycles are all highly encouraged! The West Coast Tour of The Bicycle Music Festival comes to Vancouver! This one day event is guaranteed to the be best party for bicycles in Vancouver this summer! This grass-roots community festival is being organized solely on a volunteer basis, and we really need your help to make it happen. Please please please email or phone to find out how you can help. And finally, ALL of the performers (announced shortly) are volunteering for the festival too, so please bring a pocket full of change so you can show all of the awesome performers your support. This will be the greatest Bike Shorts yet! The most professional line up of films to date, best location (Science World -- 1455 Quebec Street, 604-443-7443) and it will even be licensed (come and have a drink before the show). Secure Valet parking - Ride your nicest bike and it will be guarded by the good people of the VACC. Explore Metro Vancouver by bike on four great rides. The Vancouver Area Cycling Coalition's MEC Great Rides are here to prove two things once and for all -- riding a bike is fun, and the Vancouver region is the best place for biking in the world! The third ride in the series features one of the easiest and best off-road, flat bike loops in Metro Vancouver –- the PoCo Trail. This part gravel, part paved, and part boardwalk trail circles Port Coquitlam in a 24-kilometre circle following the dikes along the Fraser and Pitt Rivers and the banks of the Coquitlam River. The trail passes through wild areas close to the heart of this vibrant community. Combined with the Rivers and Trails Festival, music at Peace Park along the river, and a perfect fall day's ride around Port Coquitlam, this will be a wonderful day out. Check-in time is between 10am and 12:30pm. Take advantage of bike mechanics at both the start point and at the Rivers and Trails Festival, pick up a map booklet, and enjoy the refreshments along the route. Bike valet parking is available at the festival, and every registered rider gets a goody bag with cool gear from MEC, plus a route booklet you can get stamped to show you have done the ride. Pre-register online for $15 per person (16 years & under ride for free), or register on the day for $20. Sign up online before Friday, September 25 at http://www.greatrides.ca and be entered to win a gift basket! After years of close calls, conflicts, and collisions between people who walk and cycle over Burrard Bridge, as of Monday, July 13, you can finally cycle and walk safely over Burrard Bridge. During the Protected Bike Lanes Trial, a southbound traffic lane is reallocated to create a southbound bike lane separated from traffic by barriers, the east sidewalk is reserved for northbound cyclists while the west sidewalk is reserved for north and southbound pedestrians. For the trial to be successful, lots people need to cycle and walk over the bridge. - Go over the bridge on route to Kits Beach, English Bay, Stanley Park or Granville Island. - Enjoy dinner and a drink on a patio. - Have a picnic on the beach. By helping to make the one lane trial a success, you will send a strong message to the Mayor and Council that a two lane reallocation is the best permanent solution. The two lane reallocation would enable pedestrians to use both the west and east sidewalks while cyclists would have a lane separated from traffic for both directions. In the trial beginning on July 13, pedestrians will be banned from the east sidewalk which will be reserved for northbound cyclists. The banning of pedestrians from the east sidewalk is not an acceptable solution. Write letters to the editor and phone radio call-in shows letting them know you support the trial. Stay positive and avoid conflict with motorists. A quiet human-powered revolution is gaining momentum in the city of Vancouver. The city is becoming a Velo-City -- a city of cyclists -- united by the simple pleasure of experiencing Vancouver by bicycle. Find out what the Bicycle Revolution is all about at the Museum of Vancouver near the Vancouver Planetarium. Did you know that in British Columbia, about half of household transportation greenhouse gas (GhG) emissions come from non-commuting activities, often of short distance and duration, that could readily be made by other transportation modes? Getting out of single-occupancy vehicles and into biking, walking, rolling and transit is a key way to ensure Metro Vancouver's sustainability. Mobility Matters gives you a charitable tax receipt for the fair market value of your donated vehicle, a reduction in your family's carbon footprint by 4-5 tonnes per year, and a Coop Auto car in your neighbourhood.